Why does the press lie to us daily? Why are doctors lauded, when poisoning patients with chemotherapy? Why are stories showing an alternative approach to living always skewed to make the subjects seem irrational? GMOs: Those who know how bad they are for the environment, and people, and the soil microbiome won’t eat them. Those who eat them don’t know. Glyphosate soaked wheat: Those who know how dangerous this chemical is won’t eat it. Those who eat it don’t know. Medicine: Those who know how many lives are lost to (and harmed by) the (p)harmaceutical and medical cartel every year try to avoid any contact with said cartel. Those taking drugs, and trusting doctors don’t know. Cancer: Those with cancer who know how dangerous chemo is, won’t allow it to be administered. Those who do allow it, don’t know. Electromagnetic radiation: Those who know how dangerous WiFi and smart meters are won’t have one. Those who will have one, don’t know. Organ donation: Those who know the truth about organ donation would never agree to be on an organ donor register. Those who are on the organ donor register (and campaign for an opt-out system), don’t know. 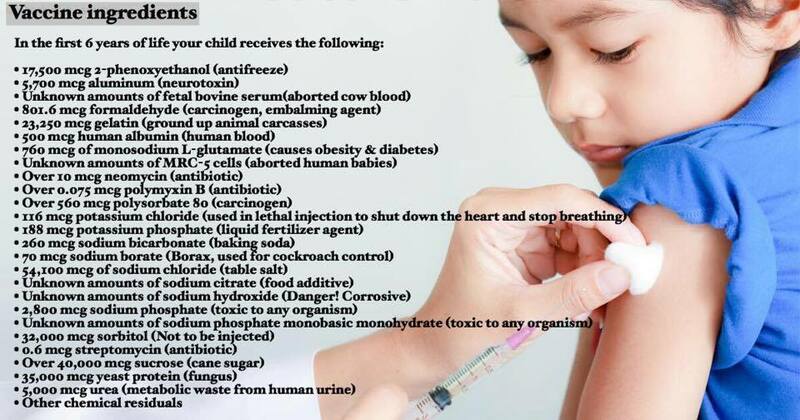 Vaccines: Those who know how dangerous vaccines are won’t allow their children to have them. Those who allow their children to have them, don’t know. I could go on, and on. There’s a pattern – the state’s plans – in fact satan’s plans – rely on our ignorance. The media feeds our ignorance every day with carefully written confections of lies, mistruths, and misdirection. Like a conjurer, with sleight of hand, the truth is concealed under carefully worded heaps of opprobrium. Ignorance is a multi-trillion dollar industry. It allows them to take our sons to war, to persuade us to allow children to change their gender, pushes ‘tolerance’ on those with strict morals, and allows those with lax morals to hate on us with impunity. When we are ignorant, we are capable of a lot of sin, and we are capable of believing lies, and those lies can harm us greatly. The truth is scary when it’s so far from the mainstream media fodder we are fed every day. I often see people post in frustration “Wake up sheeple!” but there’s nothing wrong with being a sheep unless your shepherd isn’t Yeshua. There’s no conclusion here – I have no words of comfort. Doctors keep poisoning patients, and they keep consenting to it; our food and our skies are full of poison – most are ignorant, but even those who know can do little to change what satan is doing. Posted on August 15, 2017 August 15, 2017 Categories UncategorizedTags Are we really being lied to?, Bad News, GMOs, Lies, Media lies, Medical cartel, Vaccines, What lies are we being told? The truth is elusive when money is allowed to cloud the issue. For the real facts about vaccinations, visit www.vaccineriskawareness.com and make up your own mind. I wish there was a button that just said ‘Thank You’ – as in ‘Thank you for telling me this awful thing you just shared.’ Like? No, I hate most of what I’m reading these days, and I’m frequently, frankly SPEECHLESS, but by goodness I am grateful for the bloggers who put time in to check and share the stories and opinions they do. Keep on keeping on, everyone! Take a look and tell me what you think (Link), that baby looks fake to me. It doesn’t matter, it’s all pro-vaccine, pro-poisoning propaganda, and from the comments there it’s working beautifully. The public, turkeys all, are voting for Thanksgiving. How sad. Ummm… no wonder no-one wants to admit this truth to ALL parents, who might choose to not take ’10 vaccines’ rather than risk whooping cough. This push for vaccination in pregnancy isn’t just irresponsible, it’s a crime against humanity. it quietly admits in an other article that 600 preventable, yes PREVENTABLE stillbirths occur every year within the NHS. “Britain continues to have one of the highest rates of stillbirth in the developed world – worse than Estonia, the Czech Republic and Croatia, according to The Lancet. About 600 stillbirths could be prevented each year if hospitals stuck to guidelines, listened more to parents’ concerns, and investigated more thoroughly, a report found last November. The Daily Mail is a NWO tool! Ugh! I thought something was ‘up’ when I saw the tragic story, in the Daily Mail, of a child dying from meningitis. Then the next day, another story appeared – this time a famous former rugby star whose son had meningitis but survived. More than half a million people have signed a petition demanding that all children under 11 be granted access to a lifesaving meningitis vaccine. The growing campaign was last night backed by doctors, MPs and health charities, who said it was a disgrace that British children are still dying from the disease. Growing campaign? Started by whom? Thirty people die every year from meningitis – it’s nasty and I’m not down-playing that, but to POISON every child under 11 with BEXSERO vaccine to reduce that number (which is not guaranteed, as it doesn’t cover all strains of the illness) makes NO SENSE! A new meningitis B vaccine is to be introduced into the UK vaccination schedule for babies. According to the data sheet, the manufacturers think that 78% of the 1,000 different meningitis strains will be ‘susceptible’ to vaccine-induced antibodies – so if their estimation is correct, 22% of meningitis strains will not be covered by this vaccine. They may well use this as an explanation in the event that people are affected by meningitis after vaccination. The vaccine is a DNA vaccine made in e-coli cells. It contains aluminium and so increases the aluminium burden of children. Parents should be aware that the vaccine is still in the experimental phase and has a black triangle on it to reflect this. This means it is in the final stages of a medical trial, the last stage of which is looking at what it does to the general population. Long-term antibody response is not known. The unusually high pitched cry, which is the same as the unusual cry listed in the meningitis B vaccine data sheet, is in their list of potentially serious neurological events after vaccination. If the vaccine is administered with other vaccines (as the health authority intend to do), then the child has a high risk of having a fever (69-79% of babies up to six months old, vaccinated with multiple vaccines including meningitis B vaccine had a fever, compared with 44-59% of babies who had the meningitis B vaccine alone). Pain at the injection sites, change in eating habits and irritability was also more common when the vaccine was co-administered. Babies who had multiple vaccines were more likely to be given fever reducers, which incidently, reduce antibody count and may increase the chance of autism. (http://www.medscape.org/viewarticle/711230 and Autism. 2008 May;12(3):293-307. doi: 10.1177/1362361307089518). The manufacturer suggest that separating the vaccines (not administering multiple ones at once) may reduce the risk of side-effects. The vaccine has never been studied for its effect on human fertility. It isn’t known whether it is safe for pregnant or breastfeeding women. Vaccinated nursing rabbits were studied for adverse events in offspring and none were noted but they were only followed for 29 days. The data sheet didn’t mention whether it has been tested for its carcinogenic or mutagenic potential. Would you risk harming your child – causing seizures, potential encephalopathy/encephalitis JUST to ensure they don’t end up with meningitis? It seems counter intuitive. Meningitis is a VERY small risk, the vaccine is a KNOWN risk – I can’t say I could every consider injecting aluminium and goodness knows what other toxins into a child or even my pet! We need to use our heads and resist propaganda when we see it – it’s easy to be emotive, but for a risk this small, we must be ready to let children take their chances. It’s called council tax. I don’t really own my house, do I? I understand that services have to be paid for, but I also know that I cannot reduce my bill by not using services. It’s a form of legalised (rather than lawful) extortion. Well with the advent of new laws (Link) proposed in California, which would require adults to be vaccinated or face jail, this begs the question – do I own myself? If I don’t, at what point did I sign a document to say I rescind my right to self-government? I don’t remember doing that. In fact I’m pretty sure I would have remembered a Faustian pact like that. Was your grandfather or father called up – conscripted – during the first or second world wars? The same issue applies – we don’t own ourselves, except that we do. We MUST assert our rights, and refuse on every ground (and there are lots) to allow things we believe to be wrong to be foisted on us, our children, our homes, our schools and our churches. I believe that the reason the state has got so handy at taking kids away from parents is to prepare them for just such laws – how many will dare to refuse if they face losing their kids if they refuse vaccination? Instead of allowing this over-reach by government, we must HOLD DOCTORS FULLY LIABLE THEMSELVES. A few class actions from parents, just for the distress caused by having their kids forcibly vaccinated is a good start. We must use the tools we have, and resist, resist, resist, at every turn this walk down the dark alley to oppression.